Do their puppies appear healthy, clean, and happy? Is the breeder easy to talk to? Does the breeder sound knowledgeable? (Does the breeder understand words such as topline, shoulder layback, strait legs, ear set, and basic structure/movement of there adult dogs). Is the breeder knowledgeable about training, coat care, and breed traits? Does the breeder do appropriate health testing for there breed(s)? 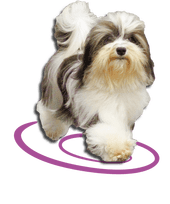 For example: Havanese should be tested for HIPS, ELBOWS, LCP, KNEES, HEART, HEARING, and EYEs YEARLY. MINI size poodles should be tested for HIPS, ELBOWS(optional), KNEES, HEART, PRA(blindness), and EYEs YEARLY. An annual exam and shots at the vet is NOT health testing. AND doing only 1 or couple of the test doesn't consider them fully tested according to CHIC and parent club. Does the breeder post the parents full AKC names on there website? Giving full names you are able to look up the OFA health testing and many times pedigrees too. Better yet, they should post results or links to them. Do the puppies come with a Health Certificate? IN FLORIDA THEY MUST BY LAW! Does the breeder guarantee the puppy? If so, for how long and, can you understand the contract terms? ALWAYS read the contract. If it's not posted on the website, ask for copy. Make sure you agree to the terms as some breeders have huge strings attached with co-ownerships on pets, fines and penalties for not following there rules. Or, they may say they guarantee puppy, but nowhere in the contract does it say so. READ Contracts. Will the breeder let you come to their property? It is not nesseccary that a breeder let you inside the home/kennel/etc. and show you around, as this only exposes puppies and adults to any germs you may have picked up at another breeder's home or pet store when stopping for supplies. If they do invite you in and ask you to wipe your feet, wash your hands, or restrict you from touching a puppy, this is ok, as this is for the protection of diseases someone might bring that could harm your potential future puppy and littermates. If they won't let you know the address or they make you meet them somewhere, question, why is this? Do they have something to hide? Do a video chat or FaceTime with the Breeder to view puppy ahead of a visit. Go thoroughly through the website, is it involved? Full of info? Detailed? Has it been around awhile? Or is it simple site with only a couple of pages, no parents AKC names, and rather quickly thrown together? When viewing a pedigree, how many generations are with that kennel name? (Example: Honor havanese has some pedigrees now with 3-4 generations of dog's names starting with HONOR.) An established breeder who shows their dogs will have good dogs and often generations showing their accomplishments by having their kennel name in many generations. Ask for multiple photos of a puppy. If they cannot supply multiple photos they could be sending you stolen pictures that are not even of the puppy you are interested in. A good breeder will send multiple images for you to look at. Will they allow you to visit without putting down money?? Always speak at least on the phone to your breeder at least once, don't just send money to unknown possibly foreign scammer. Never send payment of funds by western union. Get your potential puppies parents akc names, ofa health test results, and then you can feel more confident in getting a legitimate, healthy, purebred, quality dog. Championships add to the knowledge to know they will be more correct and beautiful too. Video chat or FaceTime with the Breeder and the puppy. Then you know the person and puppy are real. There are many websites and companies that will list breeder's puppies (all breeds) for sale. They are brokers and know how to market, sell, and advertise another breeder's puppies. They NEVER SEE, TOUCH, SMELL, or MEET the puppies. Usually they have an office of trained individals to tell the buyer what they want to hear so they can make a sale. Breeders complete a form on the advertiser's site for each puppy they wish to sell. The breeder posts the photos of the puppy/puppies they have available. The breeder writes the information about the puppy. The broker then takes that information and re-words it to make it more appealing to the buyer. But, that is basically all they know about the puppy you are calling about. They don't allow you to know who the breeder is and you won't know until your puppy is SHIPPED to you. The breeder is then paid what they wanted for the puppy and all other costs (the puppy is marked up) goes to the broker/3rd party seller. The breeder has little right to know where their pups are going and if they are going to quality homes. They don't know who the buyer is until after they pick up the puppy at the airport. You always want to meet with and talk to someone that has actually had their hands on the puppy, knows the parents and bloodlines, and isn't pushy for money right away. If the person on the phone has not touched the parents and puppies, dont buy it from them. There are legitimate websites that breeders can list their puppies on and you will always see a link to contact breeder directly. Third party brokers/websites hide the breeders name and contact information so that you can't find out who the breeders are. Legitimate websites that list the breeders and give contact infomation are fine to use, but it is up to you to weed through them to find a breeder you can trust and feel has quality puppies. They have large variety of breeds and puppies. They may guarantee the puppy. You can visit and play with the puppy, some will have pedigrees and papers for them. Note: The breeders get quick cash for their puppies and don't have to meet with buyers. Pet stores then mark up the puppy tremendously. They pay very little for each puppy and make huge profits. You have no clue what the parents look like, their size, personality, etc. due to high exposure of germs even healthy puppies are subject to antibiotics they don't need. This has caused humans to get sick from there new puppy. Rarely will you ever find a top quality breeder who allows there puppies to be sold in Pet Stores. Quality breeders find their own buyers and meet the families that will be loving and caring for their puppy. Some come from clean small breeders but they don't know how to sell their litter they created so they let a pet store do it for them. I know a veterinarian that does health certificates (a required Florida Law for selling puppies). He said more then half of pet store puppies fail to meet health requirements to sell. Some pet store puppies come in on big trucks where they pick up and haul the puppies long distances, exposing them to dozens of puppies during transport from other states. Some puppies don't arrive alive because of poor conditions, stress and disease. Some are nursed back to health by the pet shop and then sold. Puppies are cute!! Mixed or purbred, puppies are CUTE! But what will you have a year later? With a purebred puppy you're more likely to know the size, temperament, and looks of what your puppy should be like when grown. With mutts you can get shedding, hypoallergenic/non-hypoallergenic, and you CAN get the health problems of ALL the breeds involved in your Mix. There is no such thing as Hybrid Vigor. Your cute, irresistable puppy could turn into a problem, it could shed, be hard to train, have allergies or get a look completely different from what you had hoped for. Just because your neighbor's yorkie poo mix is cute, doesn't mean the littermates were nor one you find from another breeder selling them. There is no consistency in mixes. Doodles are poodles mixed with other breeds, a MIXED BREED DOG with an outrageous price tag. If you're seeking a second or third generation doodle, you found a poodle with something else mixed in the background.